Those of you who had seen the review I recently wrote on Triggerheart Excelica will know that I’m not the biggest fan of scrolling shooters from Japan that hardly make no sense at all and the ‘easiest’ difficulty falls between Veteran COD3 and Ninja Gaiden. So a lot of you may have guessed by now I’m not going to be giving this one a 10/10. However with Ikaruga there’s something about it, which I actually enjoyed. Now, pick yourself up off the floor and read why. Now, having said that, the game still comes with some flaws, a game which only uses about a third of the playing screen and any form of text to explain your story and situation so small, by the time you’ve figured out the first sentence its gone and your in the action. For those interested, I took the time to get a general idea story-wise for the beginning of the game. 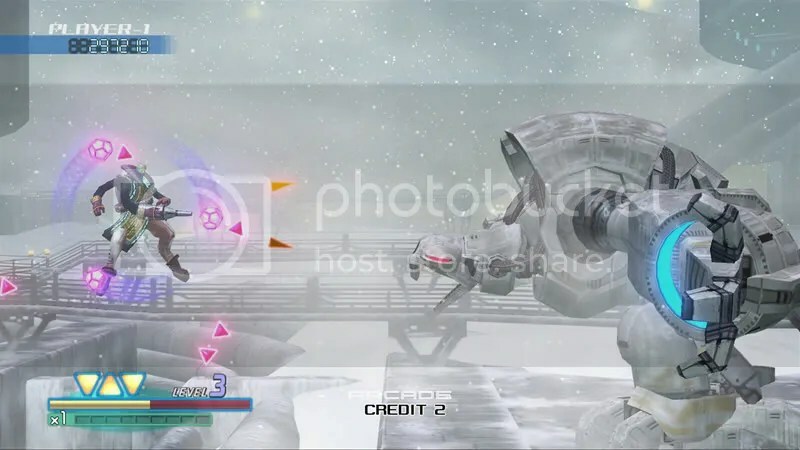 The Ikaruga is a plane, however no ordinary plane, designed by former engineering genius Amanai with the help of Kazamori and the village leaders. It was hidden in a secret underground bunker and launched via the transportation device called the “Sword of Acala”, its the first fighter built that integrates both energy polarities, and is capable of switching between the two. Polarities you ask? More will be revealed about that below. Visually the game is clean and very smooth running with its fast pace, the only thing that might slip up is you trying to keep up with everything. With most scrolling shooting games the idea is simple. Let the computer guide you, as you avoid and shoot down as many enemies as you can. Sorted. Though a slight difference is being that all your enemies are black and white, not the old school sense however. You’ll soon realize that with the tap of a button you too can switch from white or black. This in the game is known as switching polarities, and makes the game a lot more fun than first expected. This creates a lot more strategy within the game, as you can absorb shots from enemies the same colour as you. 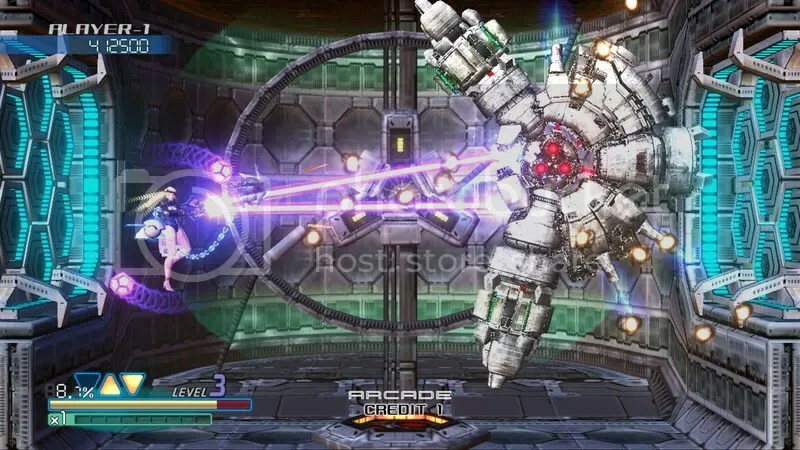 Meaning if there’s two giant robots in front of you, one black, firing a big plasma beam at you, and the other white. If your polarity is white, you can freely pass through the beam, absorb the energy and happily shoot away. 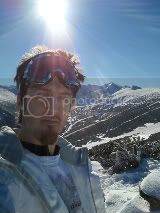 Then switch the black and take out the other guy, obviously, white enemies are weaker to black polarity and vise versa. Absorbing the energy allows you to perform large attacks with a press of the trigger. Its also possible to play 2 player throughout the levels to give you a hand to make it through those tough sections, or if you just wanna play it with a mate. Other than the shooting and explosions the sound in the game wont be testing out your surround sound speakers any time soon, however the sounds fit well with the game and don’t sound out of place. 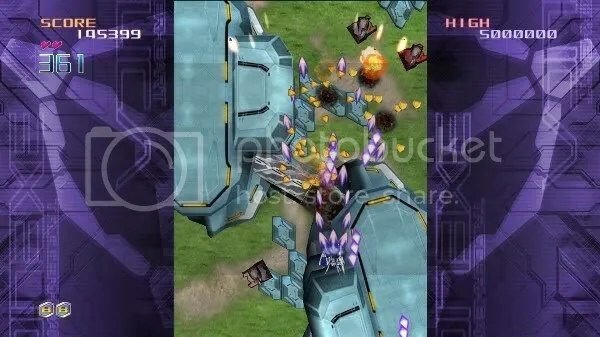 As with most arcade titles and retail games, Ikaruga is custom soundtrack enabled. The game itself is extremely short but increasingly difficult. With only 4 levels, each featuring a boss at the end, the only thing making the game longer is the desire for someone to want to make it through all 4 levels with all their continues and lives intact. As a surprise this scrolling shooter is a nice little game, but the coin op style credits and life’s in the game severely limits as to how big this game could actually have been. Had it been longer and less restricted it could have been much better. This game has Japanese shooter written all over it. As good as Japan are for making games, sadly this doesn’t seem to be one of their stronger endeavors. Your mission is…well its kind of hard to tell. With the text in the part of the game that I can only assume was the story sequence the text was so small I couldn’t even read it, not the greatest of starts ill admit. So, let’s crack on with the gameplay. You pick your character 1 of 2; the only real difference is the look of the character and their attack. It’s either a straight line firing primary with a huge explosive secondary, or a more spread out firing weapon with a more concentrated blast for your special attack. 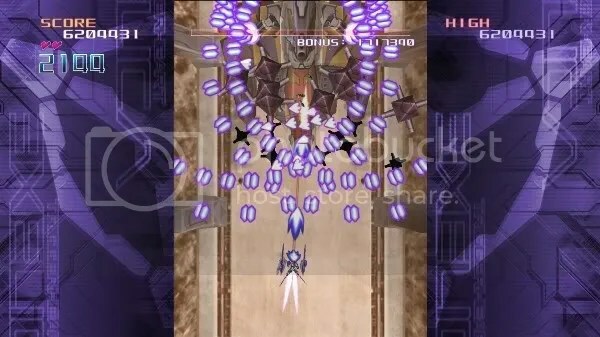 You shoot your way through 5 rather short stages making your way through fields of enemies, trying to avoid each and every attack they fire back at you to reach a boss, which tends to be more of the same. Hold shoot and pray you don’t get boxed in by their attacks. The default difficulty is set to normal, now this means that all the attacks thrown at you are only avoid able if you move past them. Sometimes, this is virtually impossible yet the main idea is to get through the game without having to use a continue. Though the continues are infinite, it seems strange as to how people can manage. Its not all lost however, to some people, it may seem more of a challenge to reach the higher scores without losing all your lives. Though I really can’t add much life to it, unless you’re the stubborn type and want those points. The game doesn’t have the most pretty of looks when you play. With a mixture of anime drawings and far from next get graphics, if you’re looking for one of those bright and good looking shooters. This fails to make the grade. With a low volume theme and just the drone of shooting to be heard, you may want to exercise your 360’s CD ripping capabilities and listen to some tunes you’d prefer. The audio doesn’t play a key role if any into the game, so you won’t be testing out your surround sound much with this. 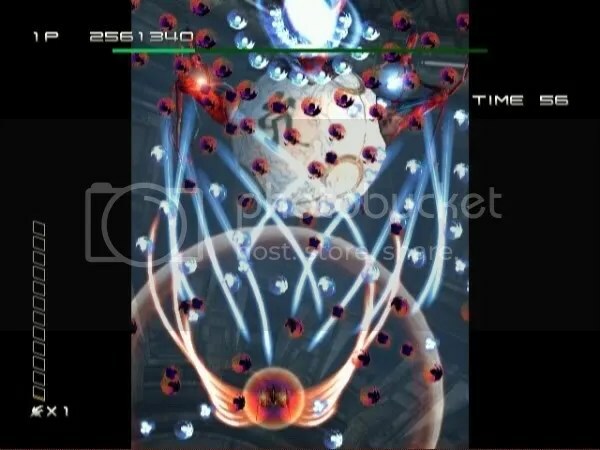 Unless you find this kind of scrolling shoot entertaining, you wont find much fun to be had with Triggerheart. Those who do enjoy it, can only see themselves enduring the same 5 stages over and over again trying to beat high scores and playing through the game to get achievements which are a feat in themselves mainly revolving around not dying once or using certain weaponry. Not the easiest of achievements to get. Sadly, though with an interesting and luring name, the game has little to offer to you for entertainment. Only fans of this kind of genre, will be tempted at most, and unless your are interested. Save those Microsoft Points. 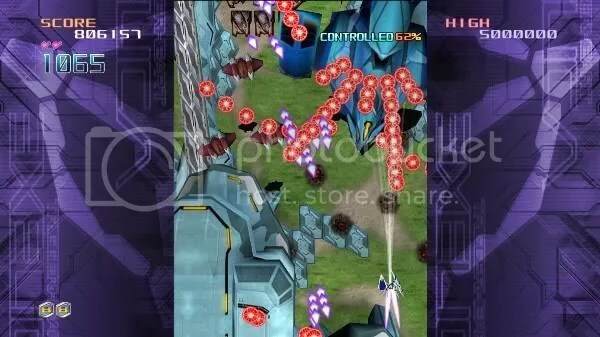 Whilst the first play of this unforgiving side scrolling shooter may be a little daunting, fear not, as a little bit of concentration and practice will see this game well into your good books. 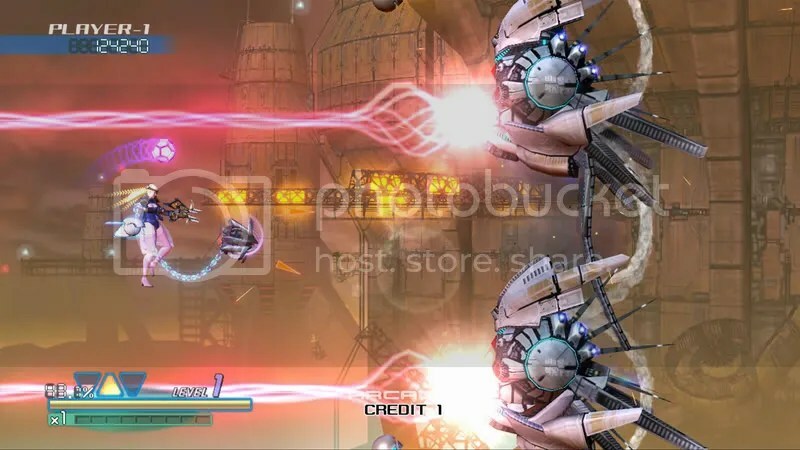 Omega V is one of the newest original Arcade games to hit the store and though doesn’t offer a mass of gaming, will still keep your entertained for your moneys worth. The game covers just 4 levels. Each in different and vibrant settings have a vast array of enemies you must fight through to reach the boss. As mentioned, the game is unforgiving and hard to begin with. But that’s purely down to being the kind of game it is. Controls are relatively easy to grasp and simple but its more gathering your feet as you start a new kind of game. You start the game with 2 characters (two more being unlock able) each with different abilities and weapons. Your weapon (changes depending on your character) is fired with the right analogue stick depending on the direction you push it in. During the mission your able to change the effect of your weapon and upgrade it by finding boxes throughout the level. There are 3 weapon types and each can be upgraded 3 levels. Find the one which suits you best and learn to use it to your advantage as these upgrades can make a huge difference in battle. Your character is also given a signature second attack which varies over the characters. The game is very smooth on the graphics end and is one of the few visually rewarding arcade games out there. Definitely a game to enjoy in HD with all the bring environments and enemies. A lot of the in-game music isn’t well heard over the noise of your attacks and shooting. Though tunes through your Xbox Live Custom soundtrack with more than make up for this. 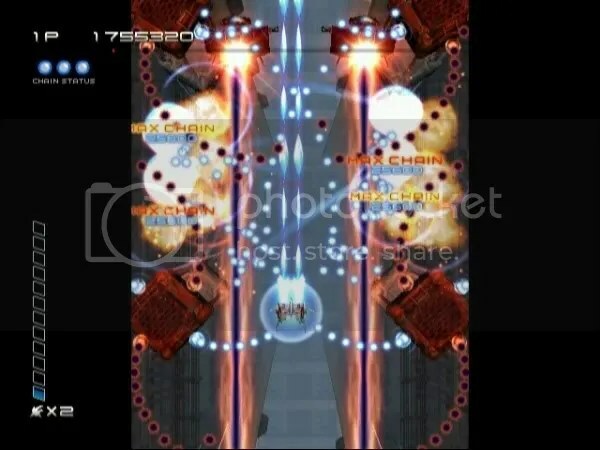 With the game only having 4 levels it may seem like an easy and short game, but unless you’re a veteran at these kind of games, you’ll be repeating some of the beginning levels a lot more often than you’d think until your rewarded with extra lives after your total game time elapsed over key times. The life of this game may decrease however with the fact that nothing changes each level, and the enemies can be predicted and timed on when they appear. A good memory and being able to anticipate what’s next can be a key to finding yourself at the end of levels faster.